Collect. Preserve. Donate. And deduct! Consult----> H & R Block. Taxpayers can pay $900.00 to receive an IRS deduction of around $4200.00, after 13 months, when you donate Stanley Mathis (6 Piece) Poetry Art Collection to a qualified public charity. Ask a CPA. Dallas Poet, Stanley Mathis, authored America's Team, the poem, that Jerry Jones of the Dallas Cowboys sold throughout his pro shops, in 1997. I will sign Six Poetry Art Certificates Of Authenticity, that allows you to take advantage of an I.R.S. income tax deduction of up to $4200.00 Fair Market Value. Stanley Mathis at more than a 50% rate of $149.00 per 20 x 30 inch poster collected! Get all 6, and pay $900.00!! 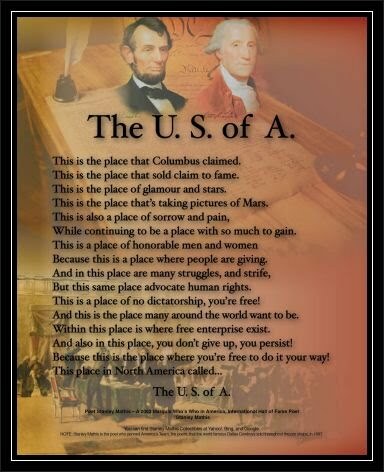 Collect (separately) my appraised autograph on 20" x 30" poetry art posters, entitled, The U.S. of A. Flag, America's Team, My First Love, My Sweet Wonder, The U.S. of A. Washington, or The U.S. of A. Liberty. I will even promote your web and social media pages by registering your new collectibles purchased, here, or at one of my online stores.